Arriving late at night at a five-star hotel, my first impressions were the number of smiling hotel staff that looked after the guests : from pushing the elevator buttons to cleaning the buttons after each use. It seemed that there was more staff than guests. Staff were very polite, smiling, and provided excellent service. However, from a transportation viewpoint, the melodic sounds of car and truck horns playing out an unorchestrated concert at seven in the morning , was the first introduction to the city’s streetscape in front of the hotel. The room looked down onto a 10-lane road intersecting a six-lane road. 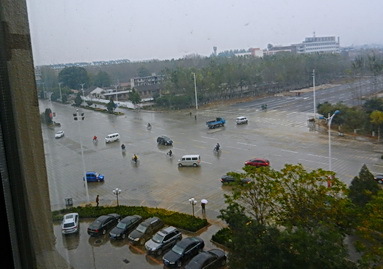 The ten-lane road was divided with two lanes on each side, separating the inner six lanes with small medians of trees. The traffic seemed to be equally divided with just slightly more cars and trucks than bicycles. 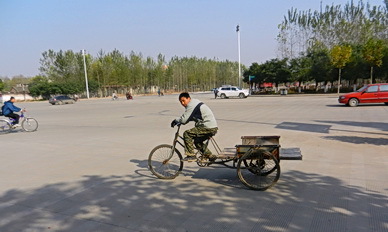 Some of the bicycles seemed more like a motorcycle – two and three wheel variety, outfitted to carry goods and work material. At the intersection, cars, trucks, motorcycles, bicycles and pedestrians did a ballet to the sound of the horn-orchestra to make their way through the intersection. Dancing, pivoting, swerving, weaving, and coming to a quick stop, were the ballet steps. In some strange way, it was all harmonious. A few days later, I was taken to the airport through the intersection, in daytime by taxi. The perspective from the back seat, was much different than from the hotel room, as cyclists veered to avoid the taxis that were not stopping for anyone. A transportation planner commented that the days for these types of intersections, were coming to an end. There was another 10-lane street through the heart of the city again with treed-medians separating two lanes from the inner six-lanes and thoroughly clogged with traffic. 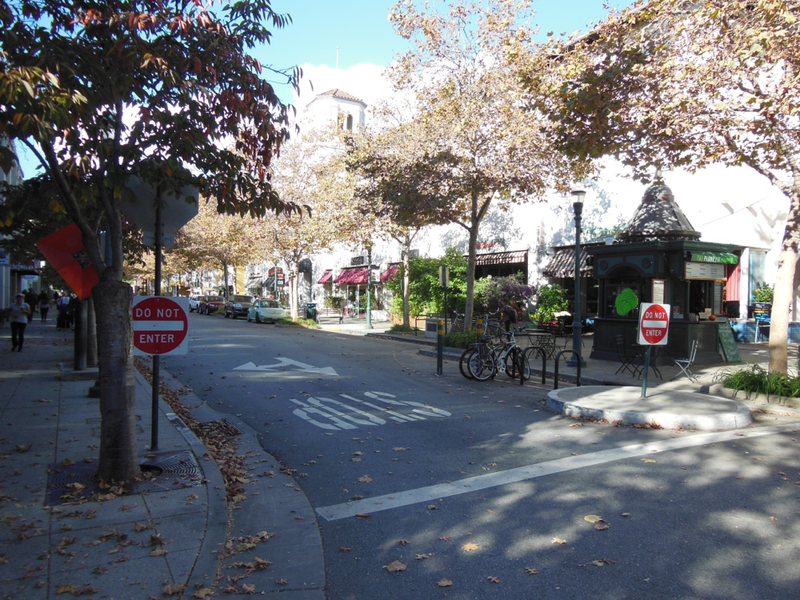 For this street, a design exercise was under way to consider how two lanes of traffic could be reassigned to bus lanes. The thought was to take two lanes away from one side of the street. Nowhere in the discussion was consideration given to taking any lanes and reassigning them to cycling. In the city core, the roads were so congested with cars that the traffic moved slowly. Somehow cyclists managed to make their way through it all. 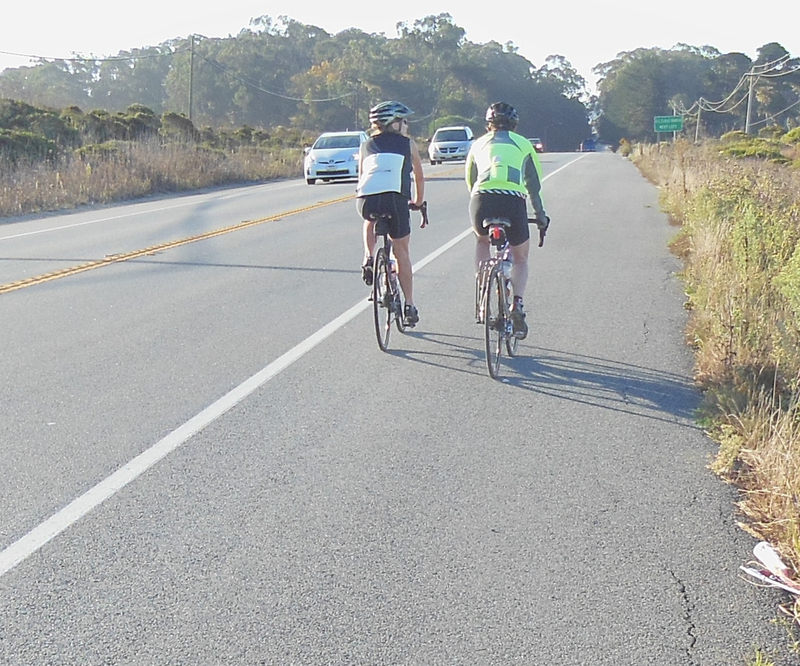 “Slow motorized vehicle driving speed at approximately cycling speed encourages cycling”, so goes the hypothesis. 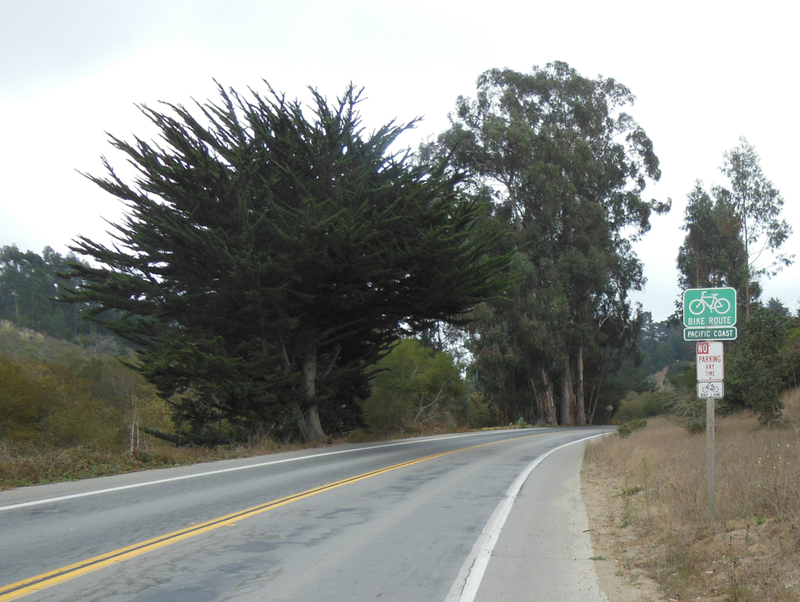 The question remains: how may cyclists will be drawn to slow speed? Just a borderline few cyclists or the mega throng that used to cycle and now drive? Now the question also may be posed as: how many drivers will be drawn from their cars if cycling facilities were installed that really appealed to drivers? Some insight to this question is being seen with evidence-based data in some cities, such as Vancouver, where a comprehensive cycling traffic volume monitoring program has been undertaken. 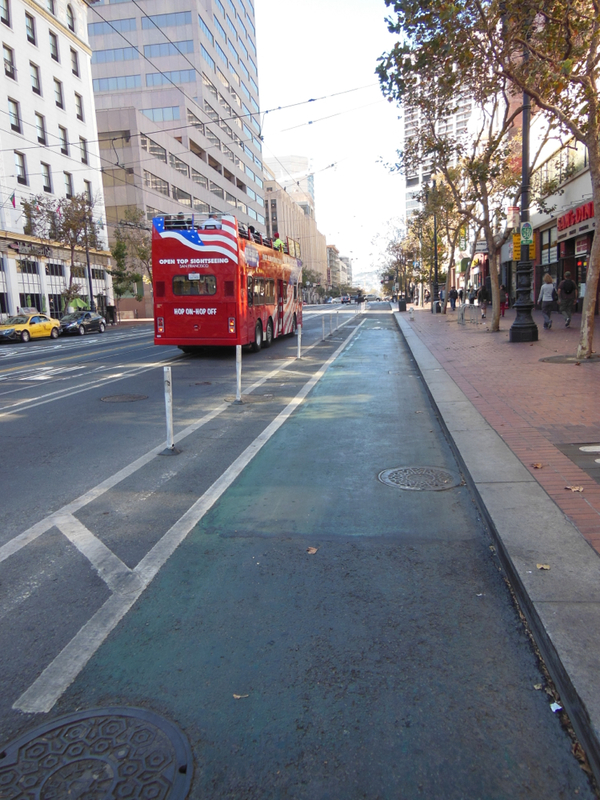 24-hour monitoring is being done on separated cycling facilities and bike lanes as well at other locations. 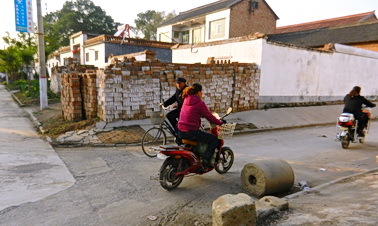 Meanwhile, in an older part of the city with walled blocks, and a 300-year old Buddha temple where personal income may not be so high, there is light traffic with most of it by a very basic moped. 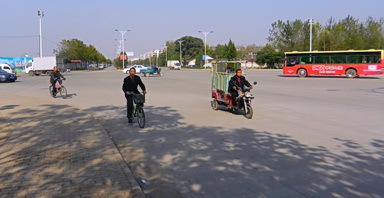 The mayor and the deputy mayor both iterated that they want Changzhi to become a model city of sustainable transportation for China. The statements came forth with conviction at private lunches with the two officials and the speakers of a Shared Transport Forum in October, 2011 where I had the privilege of being invited to speak. moved through quickly. Changzhi airport is a reminder of the airports that I used to fly into during the 1970’s in Northern Ontario — very basic with extremely limited service where one took only 5 to 10 minutes to go from the parking lot to the departure gate. Somehow, and sometimes expansiveness such as Beijing airport, does not mean efficient travelling. Changzhi is a city of approximately 700,000 people within the Province of Shanxi. Shanix has a population of about 3.2 million and is located 650 km. south-west of Beijing. 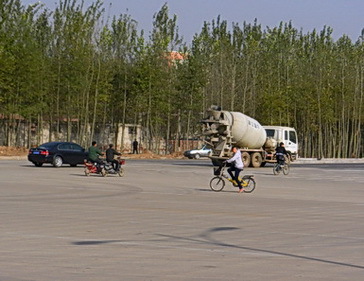 It is a transportation and industrial center. Manufacturing includes iron and steel machinery. Coal, iron ore, and asbestos are mined nearby. 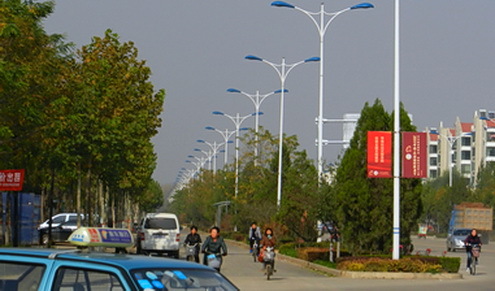 It is regarded as a medium comprehensive industrial city. People have shown their enthusiasm for moving towards environmentally sustainability in our urban and rural places while attacking causes which are affecting our personal health more and more each day. Breathing disorders are on the rise along with obesity increasing the provincial health care costs and affecting the time span we can expect to live. It is argued that for this province to move towards a sustainable greenest province with greenest cities, its transportation capacity must be environmentally friendly. Each mode of transportation must do its part. 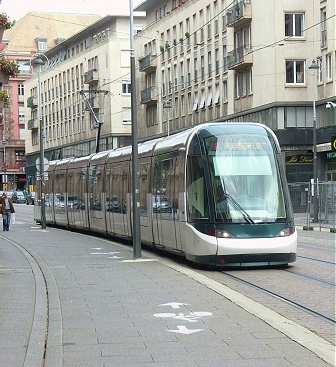 It is also argued that at this time, the transportation system is not in balance. saviour. Governments were willing to quickly jump on this bandwagon by looking to the car industry and the oil companies for post-war jobs. Streetcar transit disappeared to make a market for gasoline and diesel-powered buses. For the sake of personal freedom and to explore our cities and countryside, the populous happily embraced this trend. 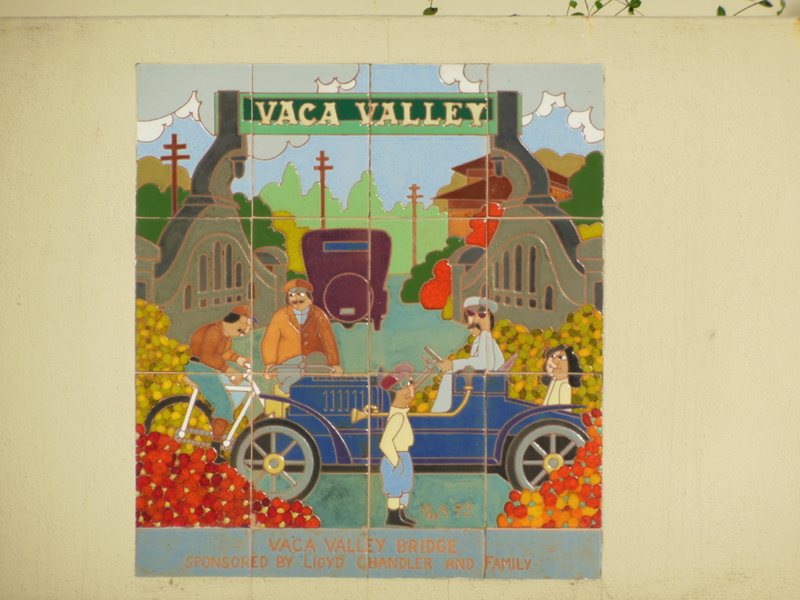 Over the last 50 to 60 years, the infrastructure for movement by cars, has been well funded. In fact, it could be argued that funding has exceeded the needs of the infrastructure for movement of freight. 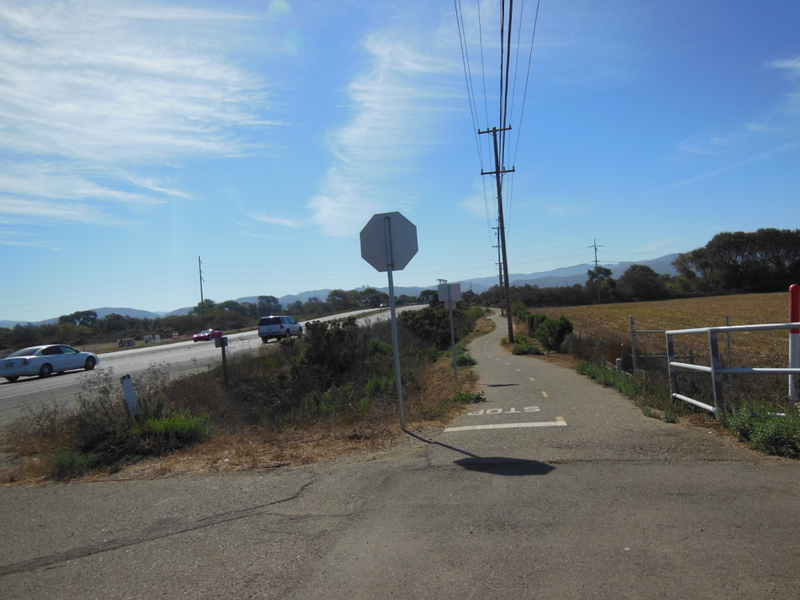 During this time, pedestrian infrastructure has reasonably kept up with its role in the system. Over the last 20 years, transit has seen growth in investment. Much still needs to be done, especially in semi and real rapid transit as well as intercity fast train infrastructures. The bus systems have moved towards maturity from a network perspective but still needs much funding for improvement of service levels to where it really is a competitor to car travel. 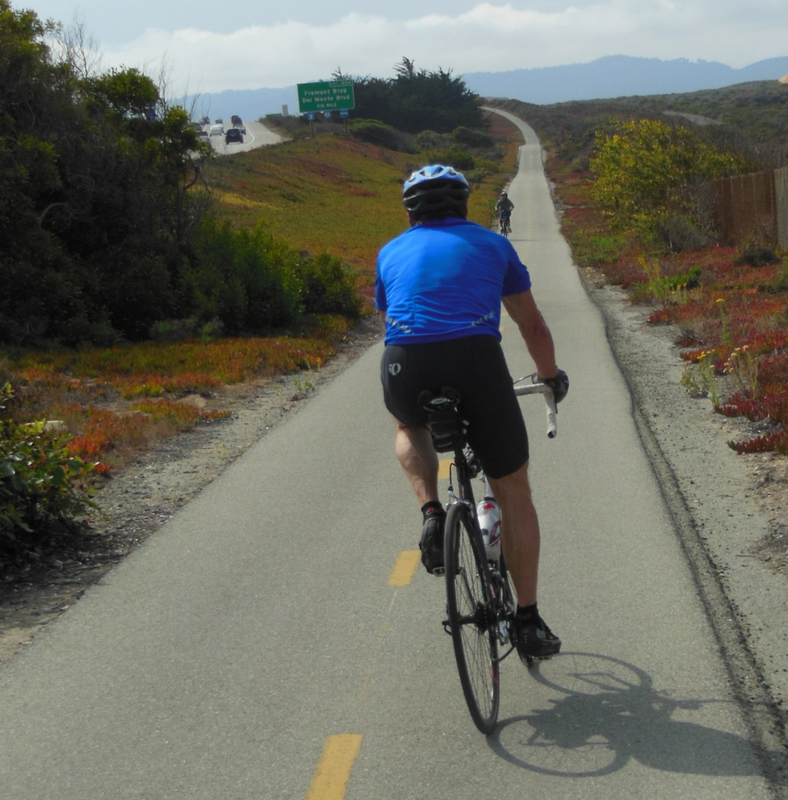 Currently, cycling as a serious competitor to car travel, is well behind where it should be. Cycling needs a large infusion of capital within this province. Infrastructure design toolkits needs to be revitalized, based on European thinking to draw people to cycling. Cycling has an important place as a mode of transportation both for taking people to their end destination, as well as, bringing people to high-frequency service, faster transit, or rapid transit lines. Looking at transportation mode share for a province such as British Columbia, some cities should have a cycling mode share of 20% while others should be in the 10% to 15% range. Technology and climate is now there for such mode shares. E-bikes can now effectively tackle hills which may be deterrents to cycling for some people. 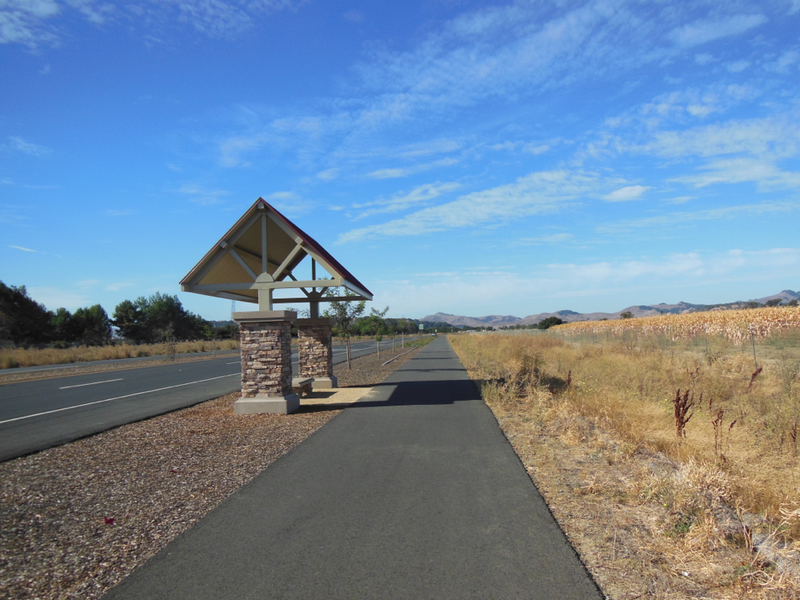 What we lack, are an infrastructure which appeals to people to make personal changes in mode of travel, infrastructure design toolkits which appeals to people who do not cycle today, and social marketing programs which would encourage people to make that change. Over the past 10 to 20 years some progress in the cycling environment has been done by all levels of governments within the province. Modest amounts of moneys have been invested in infrastructure. 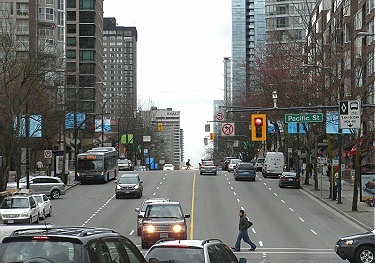 It has allowed cycling mode share to increase to the 3.7% and 5.5% levels in Vancouver and Victoria. Unfortunately, there are no other municipalities achieving that type of growth. 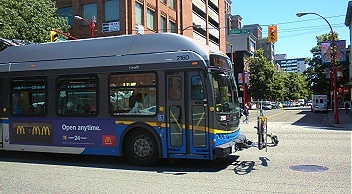 Transit buses in the province all have bike racks. Bike racks are a support tool for people to make the shift to cycling as racks provide people with an option to cycling by taking the bus when they need it. 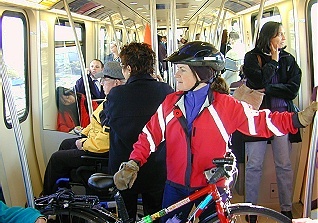 Rapid transit systems allow a modest and insufficient number of bicycles on board. 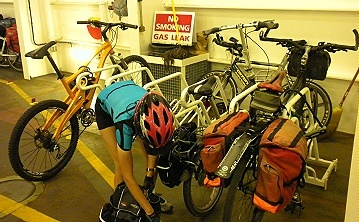 Ferries accommodate cycling. It may be observed that this is a start and that is all it is. From people’s feedback much more needs to be done and now is the time. There is a change in people’s priorities and commitment to a sustainable, healthy, and environmental province. Timing may be right for more focus and investments by governments for cycling. Teschke, Kay Dr. Cycling in Cities Survey. 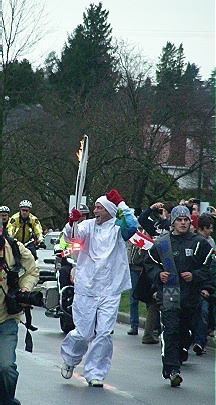 Vancouver: University of British Columbia, 2005 and 2006. Photo by HJEH Becker June 2010. Growth of cycling could see a real spike when people can effortlessly get out of their urban environment and into the countryside to do their recreational cycling. A European-style train system composed of suburban, regional, and fast trains provides a real boost for cycling with readily-accessible escape opportunities to the country. Beneficiaries would be the local retail economy of small cities and towns along rail routes. One of my morning activities includes planning my day ride(s). I want to get in about 40 kms. of cycling for exercise and also do my daily shopping along the way. In addition, meetings and business engagements are planned into the daily cycle. 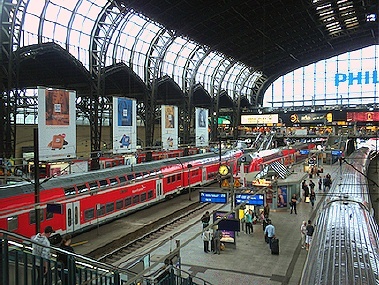 Hamburg train station, Germany June 2010. Photo by HJEH Becker. Station serves suburban to high speed trains. Just back in Vancouver from over a month in Europe, my daily cycle felt different. It is urban-based again. As I was cycling along, my mind drifted on how my habits would be different if I lived in Europe again, a place where suburban, regional, inter-city, and high speed trains are just like using a streetcar. The drawback to cycling in North American cities is that trips tend to be cycled out and then cycled back to the starting point which means one does not normally leave the urban environment when one wants to cycle 60 or 100 kilometres on a day. In Europe, with a mature network of electrified regional and inter-city trains and hourly service at a minimum, a cyclist can select their distance for any day, look at the network of villages, towns, and cities served, and pick a destination to cycle there. 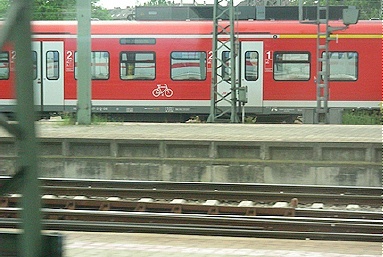 The return can be by train using bike-friendly train cars. 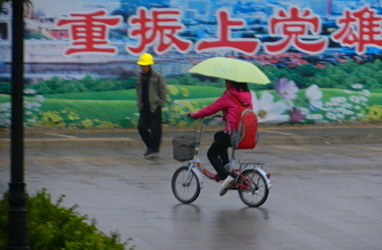 In fact, one can decide to take a train for an hour or two, then continue on by cycling . For us, being in Europe meant that we could cycle the 100 km from Freiburg, Germany to Basel in Switzerland and then take a train back. No doubling back on the route which we tend do back in Vancouver, when we cycle out to the Golden Ears Bridge –a 100 km. round trip cycle for us. 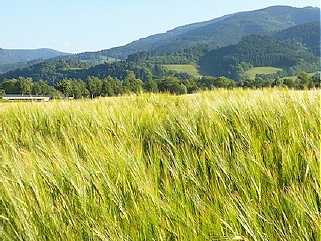 The region and the countryside is opened up to cyclists. They can conveniently cycle in rural landscape and then return home without the tediousness of seeing the landscape all over again while cycling on the way back. 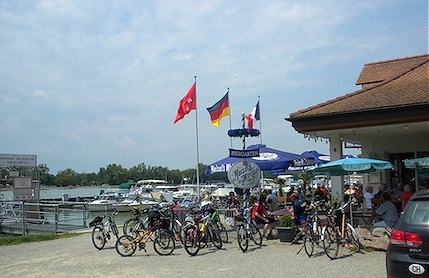 Bike parking for restaurant patrons by Rhine River, Germany. Less than 5 kms. from Basel, Switzerland June 2010. France was just across the river. Photo by HJEH Becker. This was a busy place. and leaving some money behind. With an average spending in the $10 range per cyclist, the local effect builds up as the cycling trip volumes grow. On top of that, the rail provider also sees its revenue grow, especially on off-business, quieter traffic volume days from its equipment utilization perspective. If the same rail capability were available in Vancouver, I could cycle out to Mission, Chilliwack, or Hope and then catch a train home on the same day. No boxing of bicycles for the trip if the train’s bike cars also have bike racks. Just an easy roll on and off the train car. I could also take a train out to the same locations and then do rides out from there. From Hope, I could cycle out into the Fraser Canyon and return in the same day. 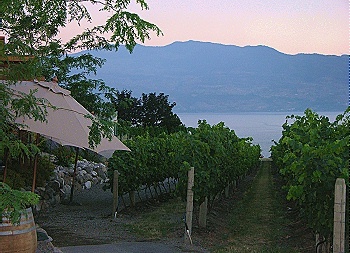 With a fast train, a day trip in the Okanagan Valley would be feasible along with a meal at a vineyard, some wine tasting and shopping. to select. Bike boxes are unfortunately needed but on stop-overs, train stations will keep your box for several days. For local retail and hospitality businesses, monies being spent at local establishments that would not happen if I would fly instead. In the Province of British Columbia, the British Columbia Cycling Coalition has been promoting a cycling touring network throughout the province, named the Soaring Eagle Cycling Routes. If this network were built and if a network of efficient, fast, frequent passenger rail system were implemented for movement of people as an option to car travel, then local economies in small cities and towns would see a real boost. 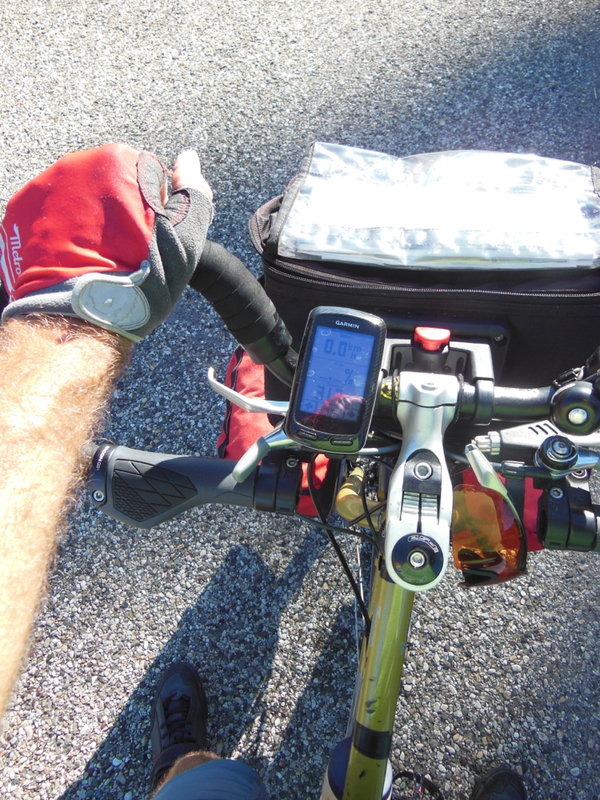 Jack is a touring cyclist who has logged well over 80,000 kilometres on trips ranging from four days and up to ten and a half months in three continents. In addition, he has logged thousands of kilometres on two and three day trips. He has also spent much time in researching the economics of cycle touring; studying networks and facilities; and the needs of touring cyclists. He is also a lead promoter of the Soaring Eagle Cycling Routes concept for the province. work sites are located out in the suburbs, in industrial parks or in a busy city district where there is little provision for construction site workers to store a bike nearby all day safely. Then on top of these challenges, one is even lucky that a construction site or a farm offers a continuously clean room to change clothing. After all, it is a construction site where users may track dirt directly into the washroom. More often at the site, it’s just a port-a-loo. Hardly an ideal spot for clothes changing. For several years I worked at a large, busy construction site for the creation of the Golden Ears Bridge and its highway approaches. I had a lengthy, convoluted round trip which was an 1. 5 hr. commute one-way, between Vancouver and Langley. My commute was a crazy patchwork of part-cycling, Skytrain, bus and then walking for 15 minutes through construction traffic and activity to and from the site office. Cycling all the way would have been even more time-consuming in order to avoid highway stretches where cycling was illegal. By bike, it would have meant a 102 kms. round trip ride. I stored my bike at Metrotown in a bike locker and saved the relaxing ride homeward –after getting off the Skytrain. The day was long enough but the bike ride was my glorious fitness saviour and destressor. It was the only way to build in regular fitness within my daily work and travel schedule. I was seriously committed, maybe abit insane. Bike to Work Week at the construction site for a cyclist, was a bizarre dream — amongst temporary trailer buildings, dust, caterpillar earth-moving machines, trucks, concrete pourers, dangerous piles of materials and potholes. At minimum, there were 120 employees at our head office site where I worked, who drove. 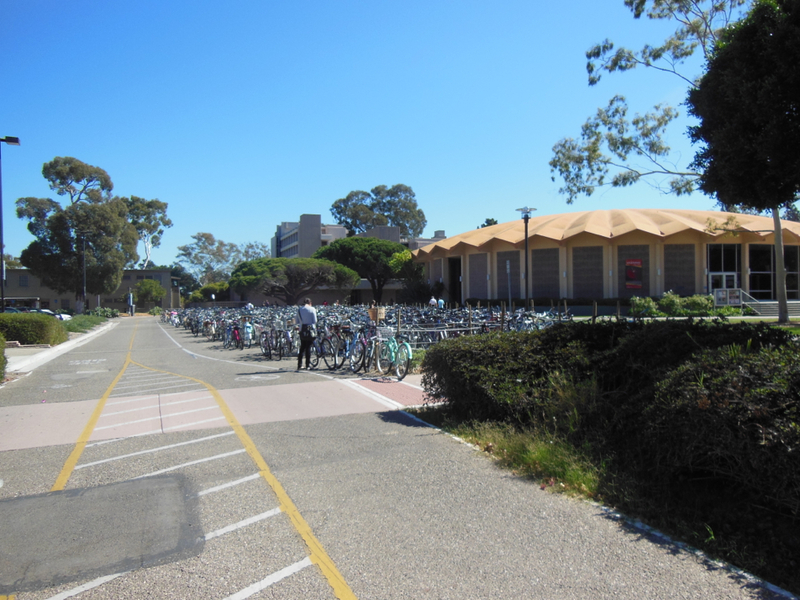 During the first year, there were no bikes parked at the office. 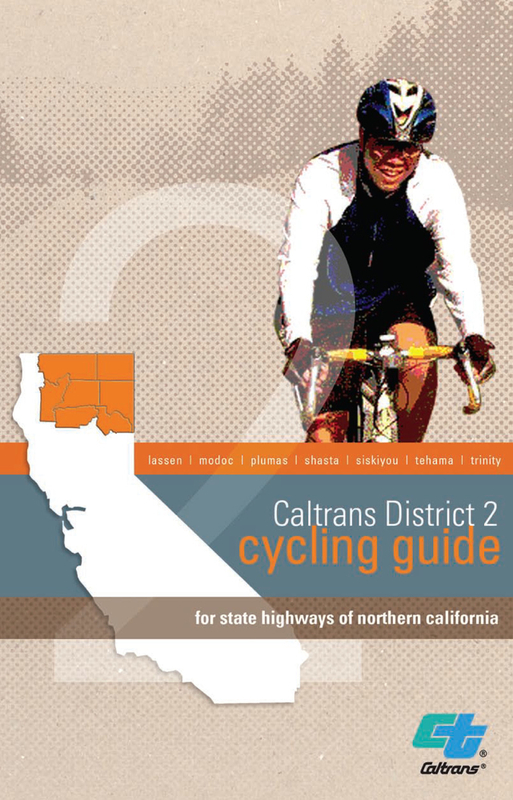 Nevertheless, I emailed to the entire organization, including 5 other work sites, to announce Bike to Work Week was on and I had copies of bike maps. Up to 10 employees picked up a map and most were ex-patriate staff, hired directly from Germany, Great Britain and U.S. 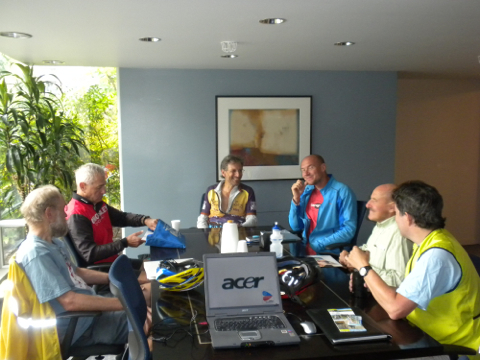 They were interested in maps for weekend cycling. 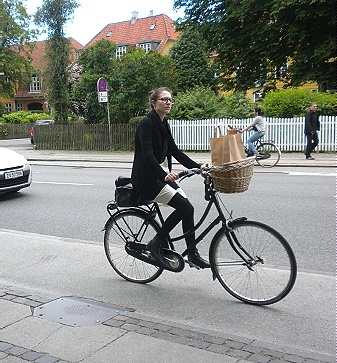 Several German employees did tell me of growing up using bikes often or simply there was more cycling back home since Germany has an established network of bike paths. During the second year, the number of parked bikes and employees riding to work, increased from zero to 10 frequent cyclists. 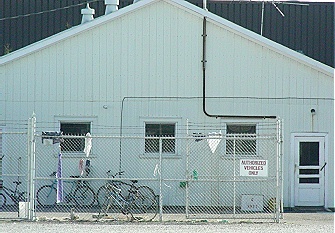 However there was nothing to lock up the bikes, so the bikes were kept by the office trailers under the office windows. Near the end of the construction project, several employees even banded together as a corporate team for an annual MS 75 km. 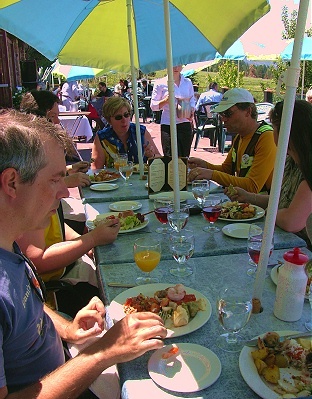 fundraising bike ride among the local wineries. 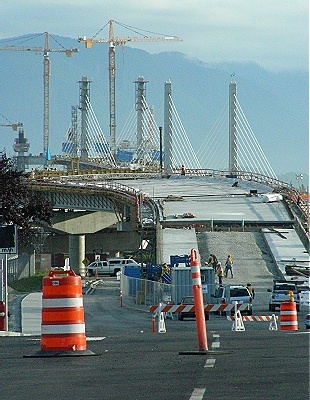 Postscript: The Golden Ears Bridge was completed in mid-June 2009. Now there are separated bike lanes on the bridge and also bike lanes on several highway approaches. Since then, we have biked the 102 km. round trip several times on weekends where there are always a few cyclists using the new cycling facilities. Local muncipalities are now expanding cycling routes into their core areas. J.Chong was Document Control Manager during the design-build stage for the $800 million Golden Ears Bridge and its highway approaches. During peak construction, there were over 600 employees and contract labourers. Daily we see orderly streams of people walking down streets. 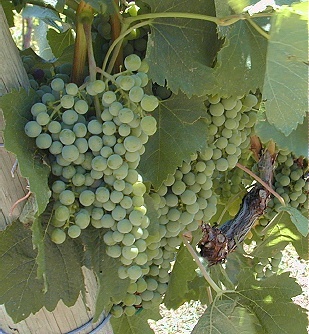 By B.C. Stadium, they are shepherded by voices from bull-horned crowd management folks perched on their high lifeguard chairs. People are directed into security check line-ups every time there is a Stadium event or competition game. 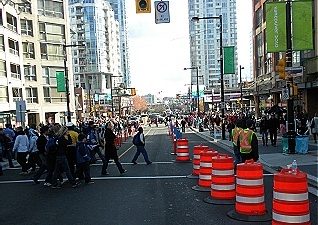 On Cambie Bridge, flow continues along the multi-use pedestrian and bike paths, sidewalks and then down the access ramps. 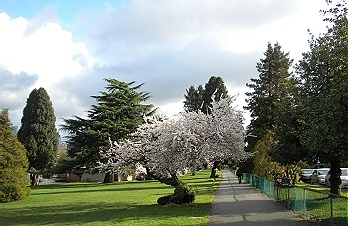 Spring-like weather causes tree buds to break free early and encourages more people to stroll and sit by the paths. 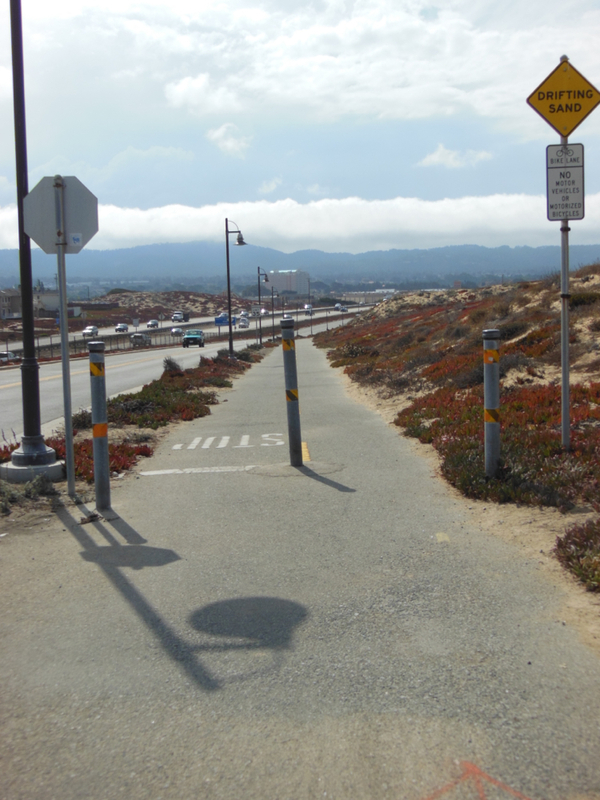 On the Seaside Path, cyclists are forced off the cycling path since foot traffic exceeds the capacity of the walking path. 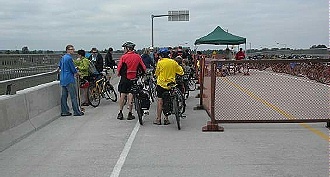 Cyclists divert onto the adjacent roads. Fortunately, neighbourhood roads are only sprinkled with occasional cars since temporary road closures and lack of low-cost car parking discourages car traffic. With a $35.00 parking fee, a parking lot across the street from a BC Stadium entry gate remains empty. 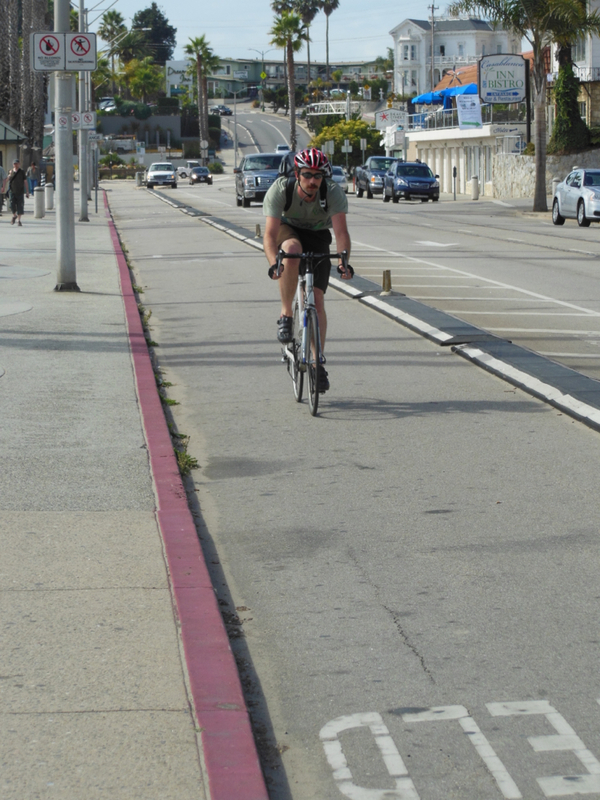 Thus, cyclists are able to clip nimbly along in their own space. If car traffic is kept light during these massive people movement events, with alternative transportation options close-by, then the neighbourhood is not overly stressed. One wonders why some streets are not closed off to roving car traffic with only residence access permitted. Path, except near Science World. Usually, the Seaside Path to the Main St. SkyTrain station, would be useless for cycling after a concert or hockey event for a half hour when streams of pedestrians overtake the multi-use path. During the Olympics, it is quite different. Even on rainy days, there is a consistent flow of people for hours, walking in Yaletown to various pavilions and then flowing into the downtown core towards Robson St. Walking and cycling crowds appeared quite orderly without much litter left behind. 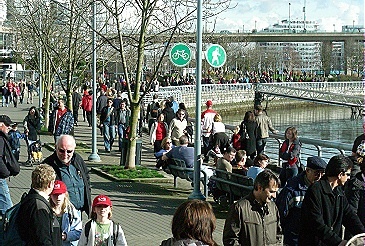 Olympic streetcar line stop passengers to Granville Island. Vancouver, BC. Feb. 2010. Photo by J. Becker. 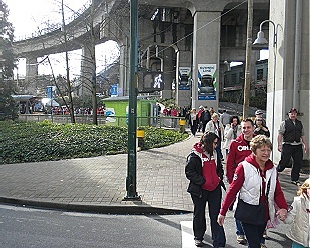 The Yaletown – Roundhouse Canada Line station entrance is often crowded with people. So far, Translink estimated for Sat. 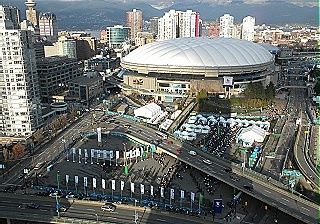 Feb. 13 a total of 210,000 passengers used the Canada Line. On a Saturday at 9:30 am and onwards, there was a growing stream of people leaving Olympic Village Canada Line station to board the free Olympic streetcar line. 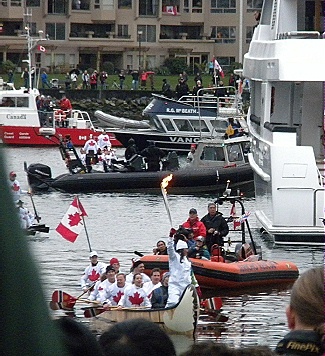 As someone observed from riding the streetcar line three times during that morning, each time the streetcars were filled to standing room capacity to and from Granville Island. One streetcar has full capacity up to 180 passengers. Does a neighbourhood die when cars are detoured from its roads or does it come alive with people? Just ask the local retailers and eateries. Urban Fare, a grocery store with an eatery section, cannot keep up with customer orders. 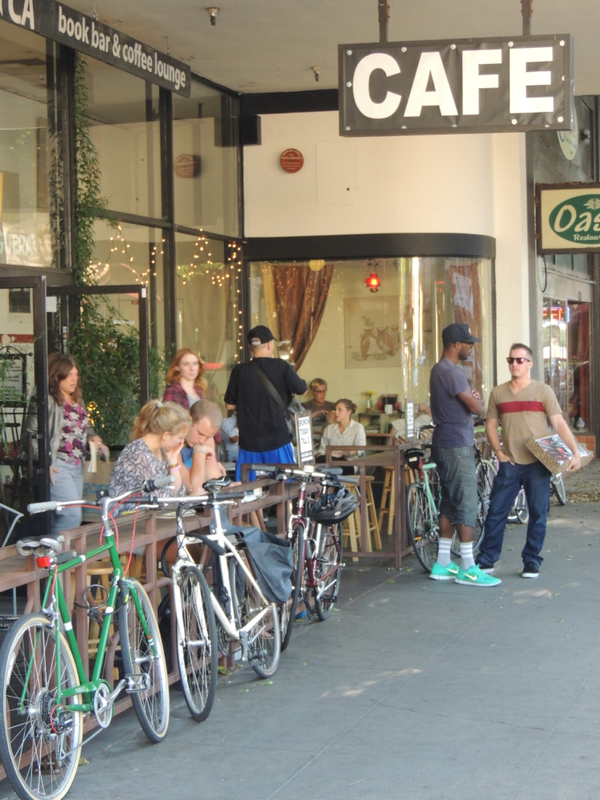 Restaurants on main pedestrian routes, are filled with diners. As we walked from the evening fireworks display down the street past these eateries at 11:00 pm, the rooms were still full. 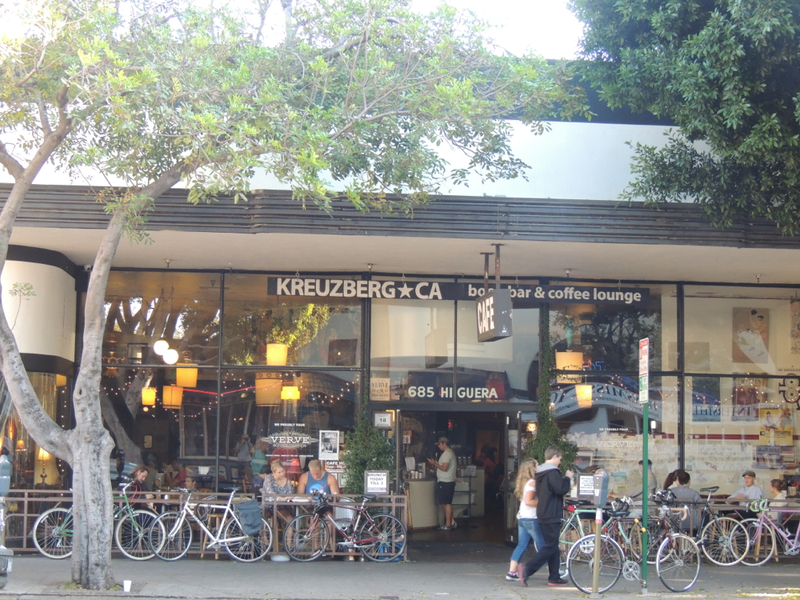 Usually, these restaurants are dark and shuttered much earlier. Noteworthy is that careful people routing reduces tension on a neighbourhood. A wise move is guiding pedestrians on sidewalks along undeveloped blocks, parkland or along retail streets without adjacent residences. passage without people jostling each other. Careful landscape design with raised curbed plant beds and lawns, keeps people on sidewalks. Trees surrounded by concrete eliminate trodden landscaping. Laneways connecting streets helps thin out traffic. 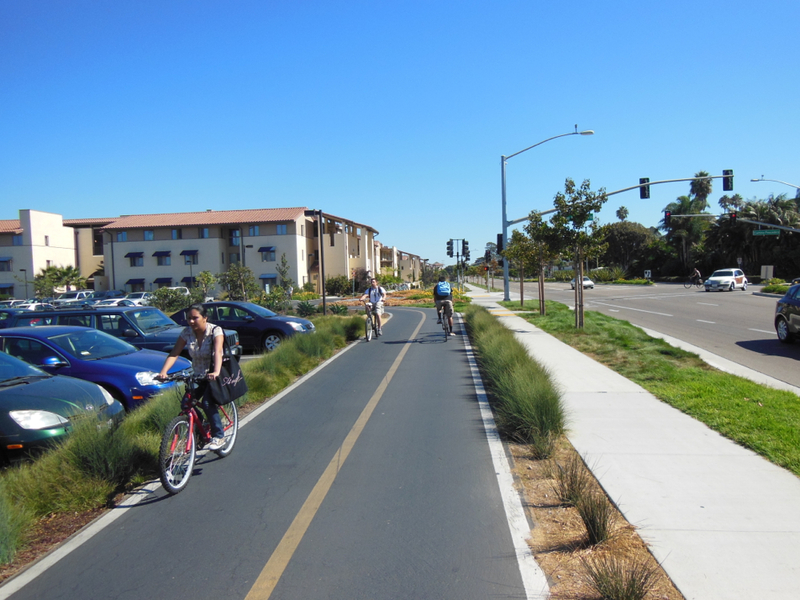 A palatable mix of car traffic reduction, combined with convenient alternate transportation options and strategic streetscape designs, can increase life on streets and liveability of neighbourhoods. TransLink. The Buzzer Blog. Feb. 17 2010. While cycling about the city and particularly around the main Games venues, each day we see signs of readiness for the Olympics. The official corporate sponsors are certainly prepared and hoping for a windfall of more customers and revenues. 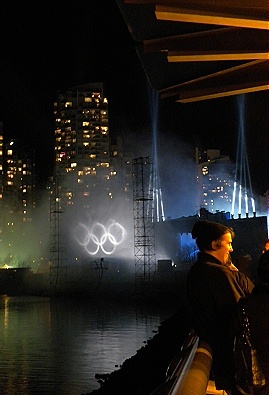 Outcomes of transportation planning for the Olympics will be critiqued on all fronts. For the next few weeks, we will see the fruits from a few years of transportation planning, forecasting and modeling mass movement of people while also ensuring their safety. The planning has been executed and hopefully, coordinated at all levels – municipal, provincial, national and international. 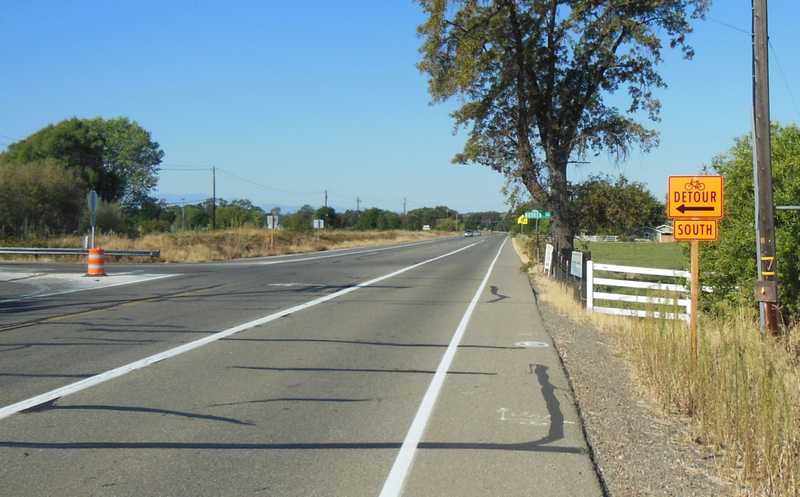 On the roads, each lane or road closure provides an opportunity for testing where the traffic goes and how much disappears. Transit ridership and cycling traffic are being measured. Some neighbourhoods are becoming much quieter with less pollution being emitted from vehicles. Hopefully, the experience will be well documented with research papers. From this laboratory will come new knowledge and new opportunities for realigning streets to accommodate all road users from pedestrians, to cyclists, to transit users, to car drivers. More appealing and comfortable people streets could be gained from this knowledge. their own schedule between several different destinations. The choreographer has to effectively mix people movement by air, water and land. Last week we posted an article which referred to some experiences of former Olympic host cities on cycling for transportation during the big event. Maple Ridge bike valet parking location. 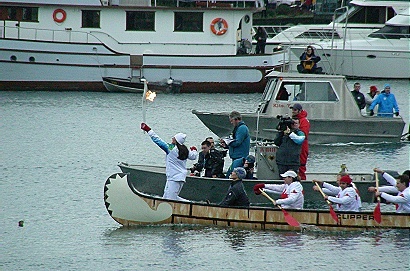 Golden Ears Bridge opening. Lineup 1 hr. early. June 2009. Photo by Jack Becker. As an addendum, there were some thoughtful responses from Sydney, Australia on local cycling during the Olympics. Thanks to Elaena Gardner from the cycling advocacy organization, Bike Sydney and cycling folks there for their feedback! 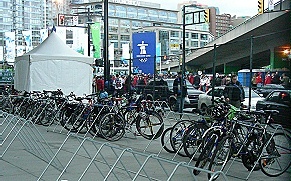 Lack of planning experience for adequate bike valet parking facilities at mass events and large scale public venues. The problem with cycling-for-transport to mass events is that bicycles are still personaltransport devices, and thus present major parking problems. At peak times there were about 300,000 people attending the Homebush site each day. If 5% of them cycled, then that’s 15,000 bikes that need to be parked, secured and retrieved, with very large peaks in demand as events end. 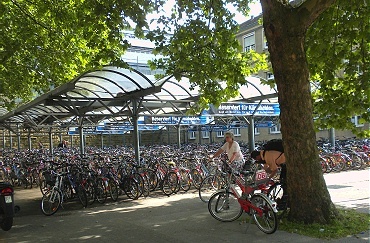 Event organisers or authorities in Australia had or have absolutely no experience in providing such large-scale bike parking facilties. Check out their discussion thread on more experiences, some information links and on legacies from the Olympics. Note: In Nov. 2009, Elaena had a keen audience when she provided a slide presentation on the latest cycling developments in Sydney to the Vancouver Area Cycling Coalition on a very rainy evening. We are glad to hear that cycling in Sydney has improved in spades since 2000!